Good morning! 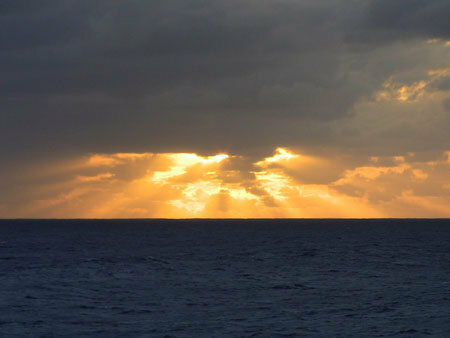 We started off day 11 at sea with a nice sunrise. The weather is breezy and cool and the sky is filled with cumulus clouds. We are still drilling at hole U1365E; the first core of basalt is expected sometime this morning. The scientists have had several meetings in the past day to revise and discuss the plan for sampling the basalt. Some of the scientists are interested in the rock itself while others are interested from a biological viewpoint. The core samples must be handled differently for each group and the sampling plan has to meet everyone’s objectives so they want to be sure they’ve got it right. The ship’s chef and kitchen staff presented Japanese food for last evening’s dinner. They went all out and did a fine job of preparing and decorating the galley to set the mood. (Several photos appear below.) Today, I am going to focus on the role of one of our several sedimentologists. Bryce Hoppie is a sedimentologist from Minnesota State University and he is especially interested in the chert that is found within some of the cores. It may be a bane to others but it is great for him. Chert can be formed from the shells of tiny organisms known as radiolarians after they settle to the seafloor and are buried. When environmental conditions (heat and pressure) around the buried shells change, the crystal structure is altered and the result is a microcrystalline form of quartz called chert. When chert forms in wide, thick layers within the seafloor, it can prohibit the upward or downward movement of fluids, including crustal water, seawater and oxygen. However, chert is brittle and prone to becoming fractured and thus allowing many fluids to move vertically through the seafloor. On Expedition 329, we have run into layers of chert imbedded in the seafloor sediments. This is important information for the microbiologists aboard the ship who are looking for microbes. If water and oxygen cannot flow through the chert, there could be an impact on the abundance and distribution of microbes within the seafloor. Cores from hole A for example are a good illustration. The sediments above the chert layer are brown while those below the chert are black. So the question is, did the chert layers have a role in causing this dramatic change of sediment composition? Or, did this change of composition have a role in making the chert? The answers to these questions and how the seafloor environment of the microbes has changed over time might be lying in those troublesome cherts.